Tommy Jutcovich started his career in education as a science and woodworking teacher at the Associated Hebrew Schools in 1973. That was the beginning of a remarkable 43 year career in education including 17 years at TanenbaumCHAT and 18 years at Ner Israel Yeshiva. After working at Harbord Collegiate, Monarch Park and Malvern, Mr. Jutcovich concluded his career as the Principal of the RH King Academy in Scarborough last spring. Jutcovich was in the hospital with pneumonia at the time of his actual retirement, and so a group of former students, teachers and friends is organizing a retirement event to be held at the new Guttman Family Science Wing at the Wallenberg Campus of TanenbaumCHAT on Sunday September 27 at 1 pm. Jutcovich, who has a number of medical challenges and is confined to a wheelchair, has established a fund through the UJA Federation’s planned giving and endowment arm, the Jewish Foundation of Greater Toronto, to benefit families with medical needs. Despite his current struggles, Mr. Jutcovich continues to display the same commitment to others that helped make him the beloved teacher he is today. The fund at the Jewish Foundation is one more example of that commitment. “There are many families who are in need of funding for medical aid which is not covered by OHIP,” he explains. “Establishing this fund to alleviate stress on families created by such needs is something which I have always wanted to do. The creation of this fund will benefit not only the physical health of those affected, but also the mental health of their families. "Mr. Jutcovich was a remarkable teacher who inspired generations of students to love science and chemistry like he did,” says Ellen Chaikof, a former TanenbaumCHAT student and current TanenbaumCHAT Board President. “When he started his career, the school's science labs were far from state of the art making his job more difficult. TanenbaumCHAT is thrilled to host his retirement event in our brand new science wing. Plenty has changed since Tommy taught at CHAT but the dedication of our teachers to our students has not. On September 27 it will be his former students’ chance to say thank you to a beloved teacher." 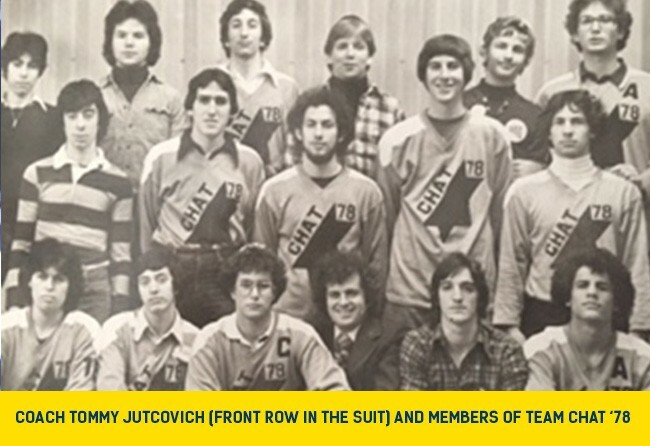 "In addition to being our teacher, Mr Jutcovich was the coach of CHAT’s first ever hockey team, Team CHAT ’78,” adds Ellen’s husband and CHAT alumni, David. “We weren't a good team, but that certainly was not the coach's fault. However, Tommy serving as our coach showed that his dedication to CHAT students extended well beyond the classroom, which is why so many of us will be coming out on September 27 to thank him". There is no charge for the event but anyone who wishes to honour Tommy Jutcovich is encouraged to make a donation to the fund he has established by contacting Amy Gnesin at 416-631-5703 or jewishfoundation@ujafed.org. RSVPs can be made online. Welcome to a New Tomorrow!